This volume concludes the series of private theological notebooks that Jonathan Edwards kept from his late teens to the end of his life. It covers the years from 1751 to 1758, a period during which he faced a variety of difficult challenges while working at the Stockbridge Indian mission and served a short-lived presidency at Princeton, then known as the College of New Jersey. 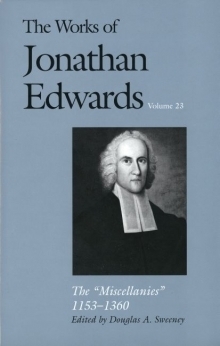 In these entries Edwards grapples with modern naturalism, critiques “generous doctrines,” and attempts to bolster Reformed thought in the face of the Enlightenment. Douglas A. Sweeney is chair, Department of Church History and the History of Christian Thought, Trinity Evangelical Divinity School.